But we crafty types need to be thinking ahead. It’s not too early to be thinking about Christmas. The deadline for Christmas finishing is early this year. August 28 to be specific. 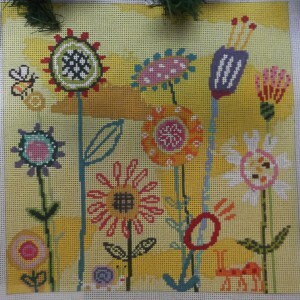 This super cute canvas is from a new series of treat bags by Kathy Schenkel. 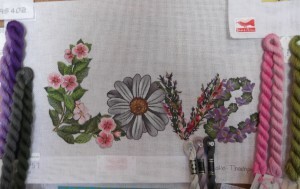 Each one comes with a stitch guide and finishing instructions (so finishing deadlines need not apply). See the entire series here. 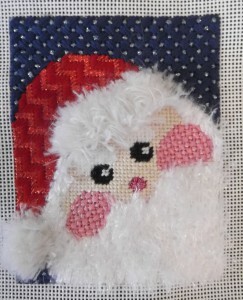 Knitters and crocheters should be thinking about Christmas as well. Now is a great time to start thinking through your list and planning your projects. No need to stress in November. Start some socks, mittens or scarves now and have a pile of them ready to give at Christmas. Or perhaps you want to give something extra special like a lace shawl. 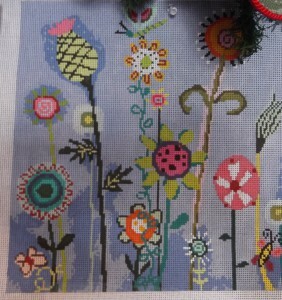 Speaking of planning ahead… our Crochet-a-long is going great. It’s not too late to join us. A square works up quickly. We have been doing two squares per month so they are starting to add up. 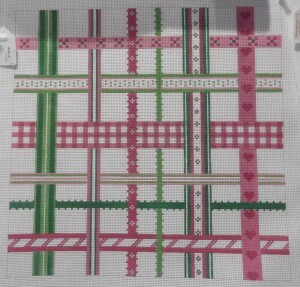 Michelle’s squares are the gray ones (she’s doing two sets, and has a green set as well). She is using Classic Shades by Universal and the shading is just gorgeous. 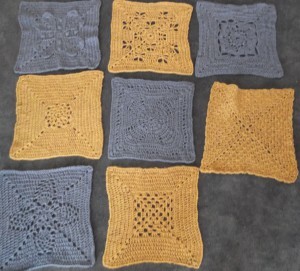 The brown/blue squares are Deanne’s and she is using Cascade 220 Superwash. There is no need to be intimidated. 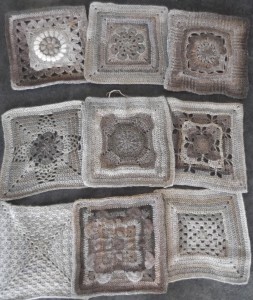 Deanne just started crocheting and is learning something new on every square. 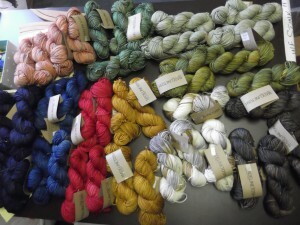 If you are doing the CAL, share your pictures on the CAL discussion thread on our Ravelry page or on our Facebook page.